It was a very special year for the Republic of Kosovo. The country experienced a breakthrough in sports, and showed her class with different pop stars. And although life in the tiny country, with a high rate of unemployment, is not always easy… There is no place in the world that celebrated so many special moments during twelve months. Let us not forget, and enjoy these five beautiful moments of Kosovo in 2016. It was a beautiful August night in Pristina. Thousands and thousands of youngsters headed towards the large park, just outside the center of the capital. The police closed the road one or two kilometers from the park, and therefore everyone had to walk. 18.000 fans gathered in the Germia Park for the first ever concert of Dua Lipa. That is one percent of the whole population of the young republic. The ambiance was great. At the end of the concert, Dua Lipa sang a song of her father, a well-known musician back in the days. After the song, the talented pop star invited her father to come on stage and sing the song together. After years of childish lobbying against Kosovo, the new nation succeeded in becoming both UEFA and FIFA member in 2016. Finally, there was the possibility to be ‘just like other countries’. Kosovo started immediately in a very strong qualification group with a number of Euro 2016 participants. The first match was in Finland. Although the new FIFA-member had a very young squad, with players that hardly played with each other, the team did pretty well. 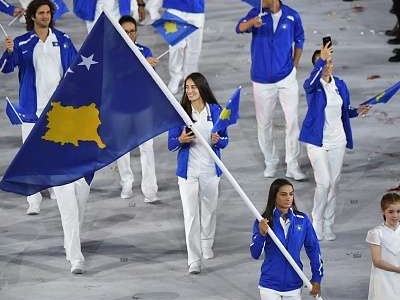 As a surprise for friend and foe, the Republic of Kosovo scored their first ever goal. Once upon a time, there was a girl that started to play judo. It was just around the time of the war that occurred in her country. Although she was not the most talented of all her friends, she had the goal to become really good in what she did. She wanted to make her family proud. And she did. And not only her family. During the Olympics in Rio, Majlinda Kelmendi fought for herself, her family, and her country. After beating her opponent in the final, she cried tears of joy. In Kosovo, people were gathered in bars to watch the historic match, like it was an important football match. A week later, Majlinda Kelmendi came back. Thousands were watching her while she was riding around in an open bus across the country. The most important street in the Balkan state is named after the most famous nun the world has ever known; Mother Teresa. Her parents were both from Kosovo. In September, the Catholic nun was declared a saint by Pope Francis. Another lady, Kosovo-born superstar Rita Ora, performed at the night before the religious event. She sang the song What child is this. Earlier that year, she performed the same song, together with the famous Andrea Bocelli. The national team of Albania attended for the very first time a big tournament. That itself was already a big victory. Many players of the Albanian squad are from Kosovo, like their captain Lorik Cana. Besides that, nine out of ten Kosovars do have the same ethnicity as people in Albania. The country showed that they were a tough opponent. In the last match, against Romania, it even succeeded in scoring a goal and win the match. Two squares in Pristina, the capital of the young nation, were full with Kosovars. After the historic victory, people joined the streets with flag and horns.